Hands-down, without a doubt, my most favoritest pasta dish of all time. I know I know, it doesn’t look like a whole lot in the picture. But I can assure you that this pasta dish is so flavorful and so filling and so creamy and so slutty. Maaaaaaaaaaaaaaany years ago, when Aaron and I were living in Spokane, I found this recipe on the internet. I have no idea whose original recipe it is anymore – I will say right now THIS IS NOT MY RECIPE – I have not modified it in any way from its original form – but I have no idea whose it is so I give credit to whoever that person is and stuff. Anyway. The first time I made it was on Halloween night, and the smell of roasted garlic filled my apartment, and every time we opened our door, someone commented on how delicious something smelled. This was back when I was learning how to cook and I was so impressed with it when I put it on the table. It was so deliciously tasty. So slutty. Aaron is not a huge fan of heavy pasta dishes like I am. This quickly became my go-to meal for when he was out of town and I had to eat alone. I may or may not be able to eat an entire pot of it by myself. Shhh. Don’t tell anyone. 1. Roast your garlic: Preheat oven to 425 degrees F. Slice each head of garlic in half lengthwise. Place each half onto a large sheet of aluminum foil, cut side up. Drizzle with 1 tablespoon olive oil. Fold the sheet of aluminum foil up to make a packet; seal the seams well so the oil does not leak out. Place in a baking dish and roast for 45 minutes in the oven. When done, remove from the oven and cut the aluminum foil to vent some of the heat out. 2. Prepare the sauce: Pop the roasted garlic cloves out of their skins with a knife, and into a blender jar. Get every clove of garlic you can get. Add the remaining 1 tablespoon olive oil to the blender jar and 1/4 cup of the heavy cream. Whirl until the garlic is mostly pulverized. Add the rest of the heavy cream, sour cream, Parmesan cheese, and salt and pepper. Whirl to combine. Sauce may be thick at this point. Set aside. 3. 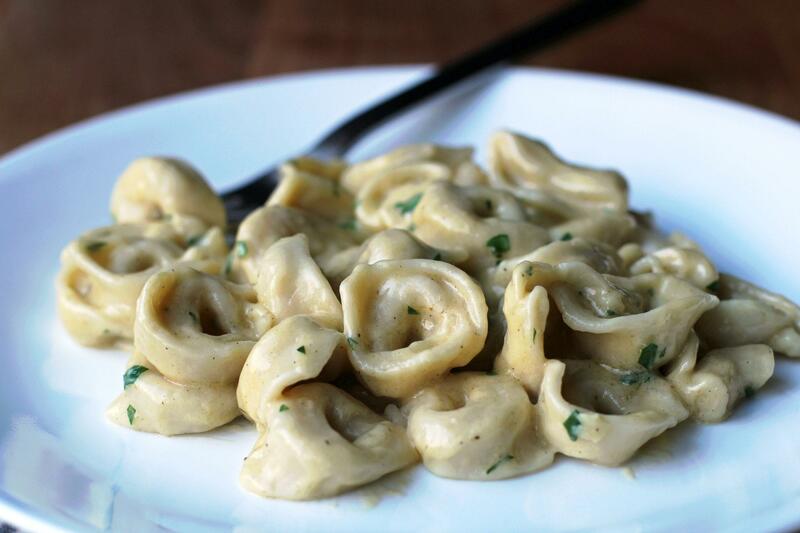 Cook the tortellini and sauce it up: Cook tortellini according to package directions and drain. Melt butter in a skillet over medium heat. Add cooked tortellini and toss to coat with the butter. Pour in the sauce and stir together to combine. Simmer for 10 minutes, stirring occasionally. Add extra Parmesan if desired, or if the sauce appears too thin for your taste. Stir in minced parsley if desired just before serving.